SAN MATEO, CALIF. February 9, 2018 — Last week, udelv, a Burlingame, Calif. company, successfully launched its autonomous, last-mile delivery vehicle today and made the world’s first public road test deliveries from Draeger’s Market in San Mateo to two nearby customers. Udelv CEO Daniel Laury was joined by Delivery Guys CEO Armen Gasanyan. On February 11 at 3:30 p.m., Gasanyan and Laury will discuss innovation and autonomous deliveries as part of a National Grocers Association workshop at the Mirage Hotel in Las Vegas. 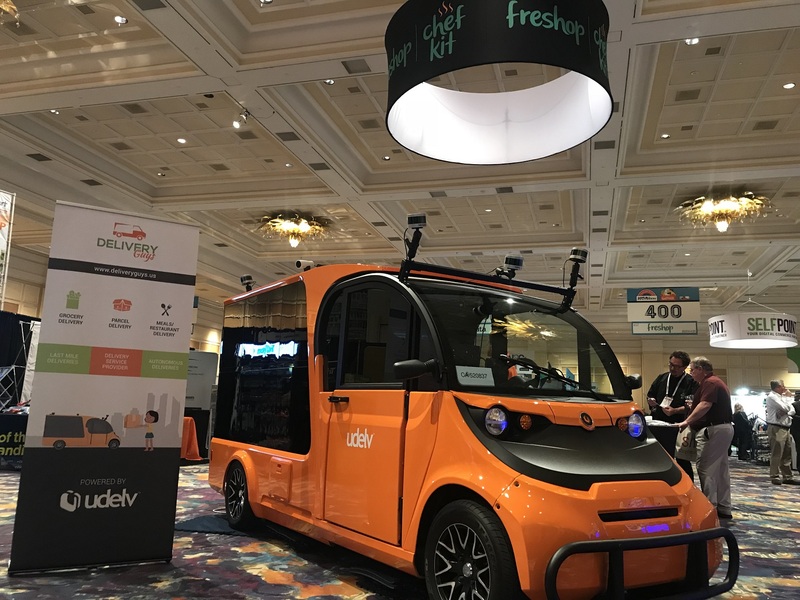 udelv and Delivery Guys will jointly display udelv’s signature orange vehicle at the National Grocers Association meeting in Las Vegas Feb. 11-14 as guests of Freshop in Booth #301. The signature orange udelv vehicle will be displayed in the booth for the duration of the show. Known as The NGA Show, the meeting is a gathering place for independent retailers and wholesalers to explore the latest technologies, products and solutions.